After suffering through the horror that was Druaga, I figured that my next gaming experience HAD to be more pleasant... and I was right! In fact, once I started in to La Pucelle: Tactics, I found it to be quite enjoyable. 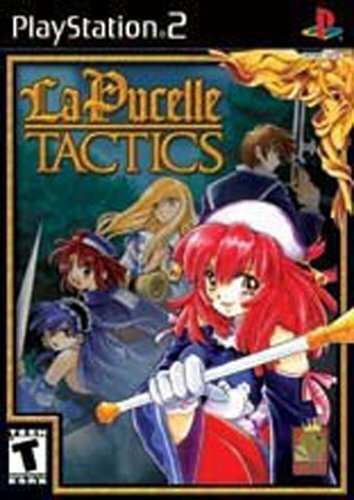 La Pucelle: Tactics is a light-hearted Tactical RPG, where the gimmick has to do with dark portal squares found in various places around the grid-based battlefields. These dark portals emit energy which flows out in a straight line until it encounters a character, where it then alters its path to the same direction that the character is facing. Each portal has an elemental attribute, and this can either boost or hinder the stats of any character standing on one of the affected squares, depending on what the character's attribute happens to be. The portals will also spawn new enemies over time, so destroying them integrates into the strategy of the battle. Each portal has an HP, so to dissipate it you must use the "Purify" command until its HP drops to zero. Once that happens, the portal and all of the squares energized by the portal explode into nothingness. Any enemy that happens to be standing on one of the energized squares when this happens will receive damage. And if the energized squares happen to form a loop of a large enough size, then what the game call a "miracle" happens and all enemies inside the loop will also take damage. The "Purify" command is also used to turn baddies into good guys who will join your party. The more you purify an enemy, the more likely it is the bad guy will join you once you take him down. And this is definitely necessary as you will need more than just your default party to survive past many of the battles. Luckily the game will show you an indication of how close an enemy is to converting. Only eight characters are allowed to be put into play during any one battle, but you can convert many more baddies than that, which gives you choices as to who you want to use. And of course, you can't convert every enemy, like the bosses, for instance. The real star of this game, however, is the character interaction during the cut scenes. The dialog is often clever and entertaining, and matches extremely well with sprite animations. Some characters have their face pictured in the box next to their text which displays their current emotion, but the sprite animations are so good at displaying attitude that these portraits really aren't necessary. I would have much preferred the bubble format, where a text bubble appears over the character, so that I could read and watch the sprites at the same time. Occasionally there is actually some spoken dialog, and most of this is wonderfully done. They actors really brought life to the characters, and I actually found myself wishing more of the text was voiced. Still, all games have their downside, and this one is no exception. The biggest problem I had was the viewing of the battle area. Often times there would be spots that could not easily be seen. The game usually gives you the ability to rotate the map in 45% increments, which helps, but sometimes it doesn't give you this ability, and other times it just doesn't matter. For instance, when there are a row of trees right near a cliff wall, changing the angle doesn't help. The only thing that would give a clear view in this situation would be to make the trees semi-transparent, but the game doesn't do that. Additionally, the various windows could have benefitted from some semi-transparency, especially the information window that pops up when your cursor is over a character. Finally, there is the battle system. This is pretty good overall, but I think it could have used just a touch more refinement. When you select a character from the menu, they then appear on the starting square. From here you can move, attack (if they're already next to an enemy), purify (if they are next to something that can be purified), use a special ability, equip items, or use an item. If you want to cancel the character you just picked, however, then you first need to move them to a different square, and then cancel the movement. Why couldn't they just allow you to cancel from where you were already standing? When selecting the "Move" command, an area of squares will be highlighted which indicates where you can move. If you move your character, and then decide that you'd rather move to one of the other squares, you first have to cancel your movement and then do it again. You can do this as many times as you want, so I really don't understand why they executed it this way. It is annoying, completely unnecessary, and doesn't add anything to the tactics of the game. The only time you can no longer move is after you perform one of the other actions on the menu, or assist in a battle. Getting assistance from your allies when one of your characters attacks a baddie can be extremely useful. Assistance comes when an ally is standing next to or behind the character that is attacking. Your allies won't hit as hard as they would if they were the ones doing the main attack, but they can still make the difference between an alive bad guy and a dead one. Of course, the bad guys can do this assistance thing, too, so you need to be watchful of who you attack, and how many allies they will have backing them up. The battles may not be the most exciting thing in the world, but they keep you thinking enough so that you don't get bored with them. What really keeps you coming back to this game, though, is the story and character interactions. The overall story is that you are part of a church of demon hunters called La Pucelle, and the main character, Prier, is trying to become the next maiden of light. But all this is more like a background story, as every battle is not there for the sake of this goal. The game is broken up into chapters, and each chapter has a different story taking place. The stories are fairly simple, yet interesting enough so that you want to find out what happens next. La Pucelle: Tactics was quite an enjoyable game. It never got overly frustrating and the battles really did encourage tactical decision-making. Plus, the use of separate stories made each chapter interesting yet kept the plot from becoming overly complex. And the interaction between the characters made me want to not just know about the story, but how the story plays out between the characters. Overall, I'd have to say this is a game worth playing. To learn more about it, check out the official website of La Pucelle: Tactics.